As I'm sitting here writing about toast, buckets of snow keep falling in our yard. Which means that perhaps I really did jinx an early spring with my last post, talking about getting my closet ready for warm weather. Oops. It appears March in her true form has come in like a lion, and while the weather may be reverting to winter temps, our kitchen is fully ready to move into springtime fare. You may remember our Open-Face Spring Sandwich Remix from last year. It's still one of the most fun things we've done, mostly because I don't think I've ever been that full and happy after having open face sandwiches. Anyways, as I smile and get nostalgic about a time that was very different, and not that long ago (we made those + photographed them when we lived with Robert's parents during our renovation) I'm excited to share a toasty upgrade, again! Even though I've been gluten-free for a while (two years, whaaaaat! ), and the bread options usually pale in comparison, I still have a very real love for toast. Simple toast, and complex toast alike. Speaking of which, I just discovered Happy Campers Hemp Hemp Hooray Bread. The nutrition label had my very excited when I saw there's absolutely no sugar, and tons of fiber and protein. Even though I'm limited in my base options, the beauty of toast is the topping combinations are limitless. 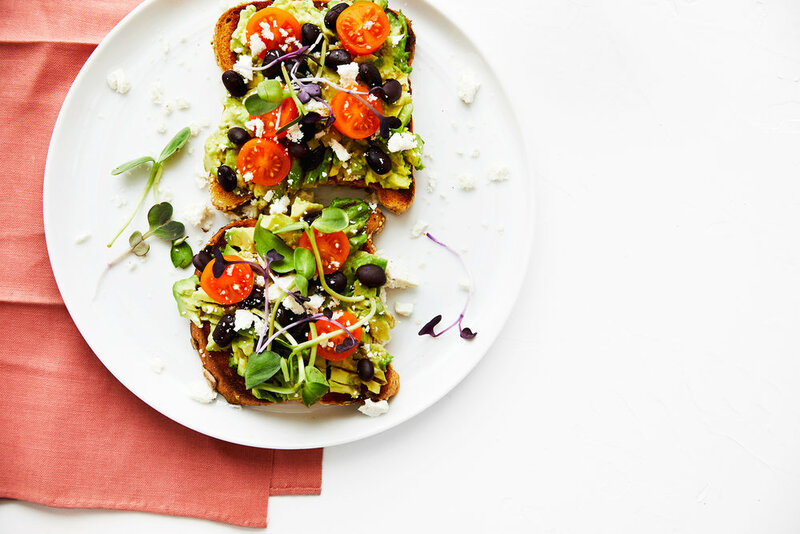 Some of these combinations are also a nice little reminder that spring produce is about to be super abundant, with radishes and micro greens popping up at the market, making the perfect addition to a classic avocado toast, or my new fav - the "Time for Tea" toast, which was inspired by a classic tea sandwich. The recipes are loose, because it'll have a lot to do with your bread size, and whether you're feeling like 1 or 2 slices. Also for the GF crowd in particular, since Gluten-Free bread tends to be on the smaller side, sometimes it's nice to have two small slices. You'll see variations below that are perfect for morning, afternoon, and late nights alike, and even if you hate the cheesy names, the flavor mixing is spot on. Toast bread of your choice. Spread layer of hummus on the bottom. Top with olives, rotisserie chicken, red onion, feta and parsley. Drizzle olive oil on top to serve. In a small mixing bowl, fluff the fresh ricotta with a fork. Mix in honey until fully coated. Layer the ricotta on the toast first, followed by strawberry slices. Top with granola and drizzle with honey. 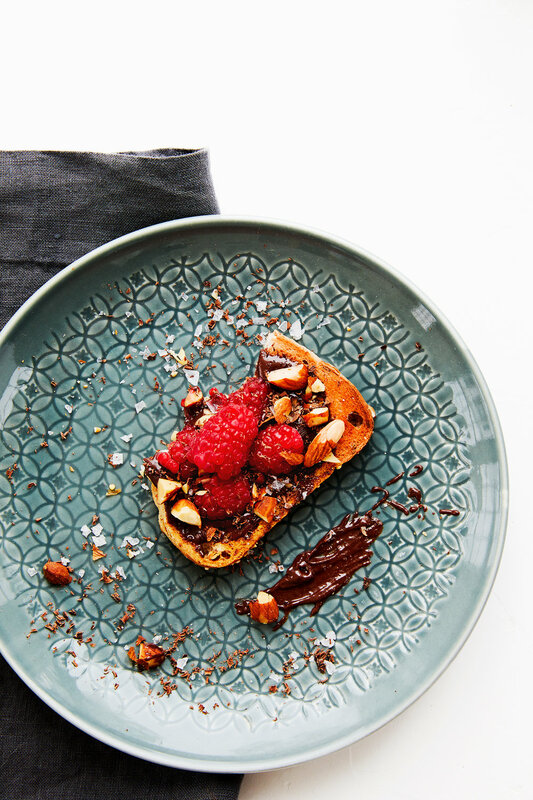 Spread the chocolate tahini spread until even. 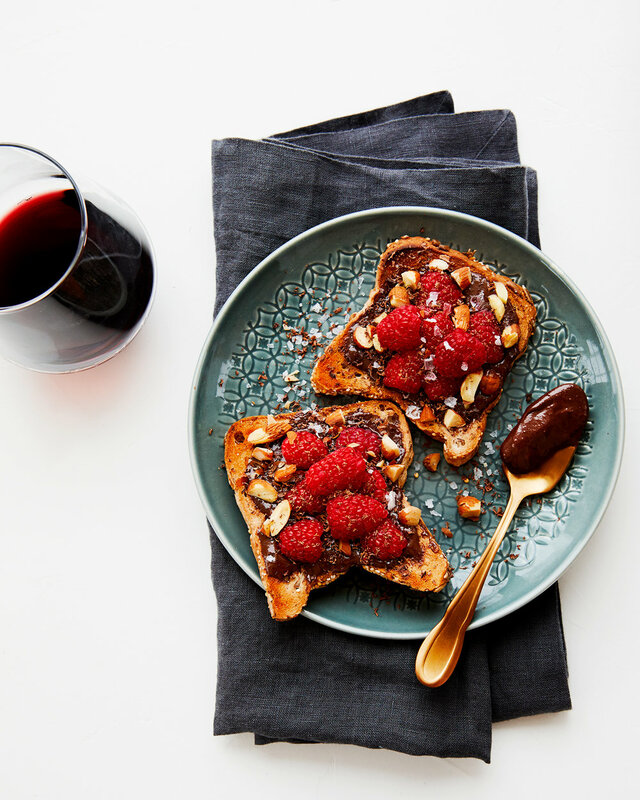 Top with roasted almonds and raspberries. a pinch of flaky sea salt. Spread layer of cream cheese on the bottom. Layer avocado, followed by the radish slices. 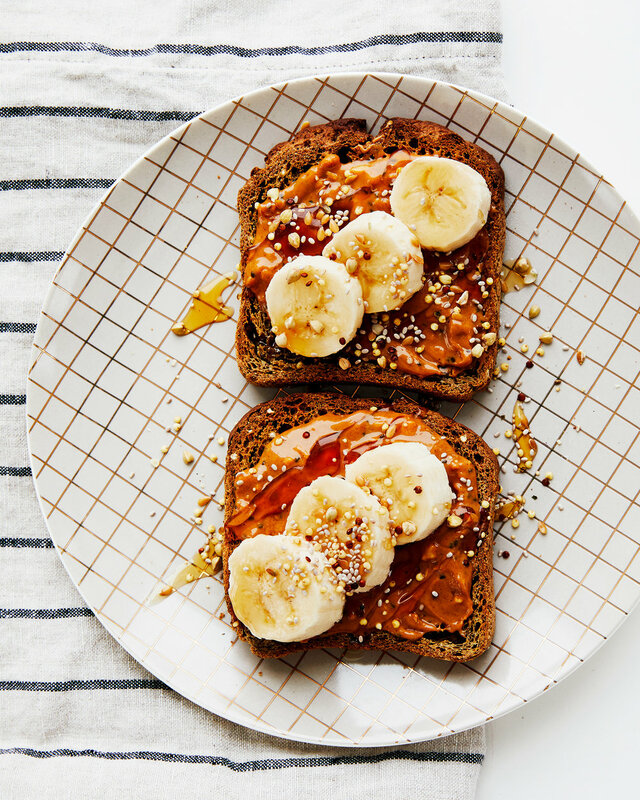 Evenly spread almond butter or peanut butter on top. 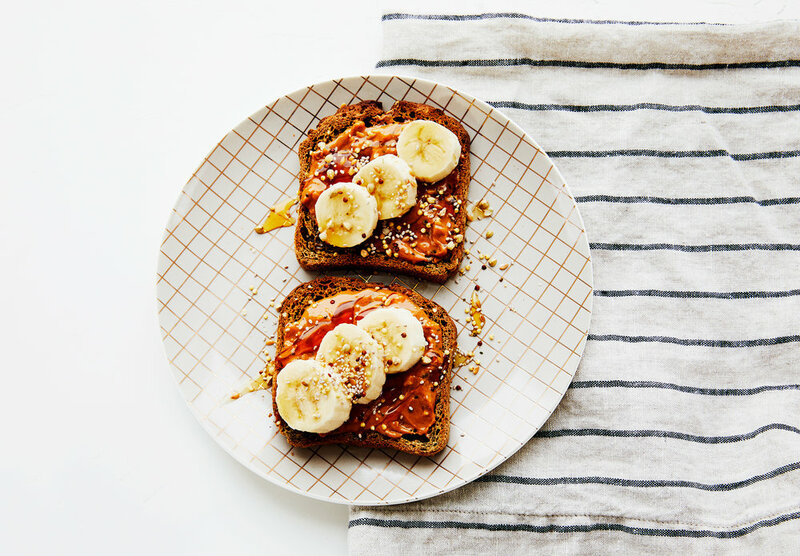 Layer banana slices, followed by chia seeds or ancient grain blend. Drizzle honey on top to serve. Place the avocado on the toast and smash with a fork. Top with cherry tomatoes, black beans, cotija and micro greens. want to use some of our exact ingredients? find them below!